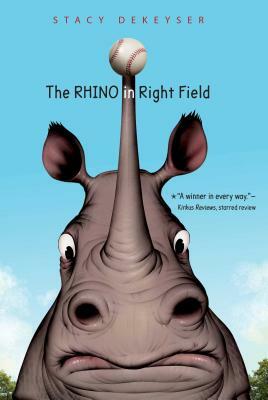 A boy who loves baseball must get past his hard-working immigrant parents—and the rhino in the outfield—to become a batboy in this laugh-out-loud middle grade novel in the tradition of The Sandlot. Nick wants to change his life. For twelve years, he’s done what his hard-working, immigrant parents want him to do. Now he’s looking for his own American dream and he thinks he’s found it. The local baseball team is having a batboy contest, and Nick wants to win. But the contest is on a Saturday—the day Nick has to work in his father’s shop. There’s one other tiny—well, not so tiny—problem. A 2,000-pound rhinoceros named Tank. Nick and his friends play ball in the city zoo—and Tank lives just beyond the right field fence. Nick’s experience getting the ball out of Tank’s pen has left him frozen with fear whenever a fly ball comes his way. How’s a lousy fielder going to win the contest? Nick practices every day with his best friend, Ace, and a new girl who has an impressive throwing arm! But that’s not enough—to get to the contest, Nick has to lie to his parents and blackmail his uncle. All while dodging the school bully, who’s determined to win even by playing dirty. Nick will need to keep his eye on the ball in this fast, funny story about a game that can throw you some curveballs—just like life! Stacy DeKeyser is the author of The Brixen Witch, which received two starred reviews and was a Chicago Public Library Best of the Best Pick, and its sequel, One Witch at a Time, as well as the young adult novel Jump the Cracks and two nonfiction books for young readers. She lives in Connecticut with her family. To learn more, visit her online at StacyDeKeyser.com.